The Classic of Poetry, also Shijing or Shih-ching, translated variously as the Book of Songs, Book of Odes, or simply known as the Odes or Poetry (Chinese: 詩; pinyin: Shī) is the oldest existing collection of Chinese poetry, comprising 305 works dating from the 11th to 7th centuries BC. It is one of the "Five Classics" traditionally said to have been compiled by Confucius, and has been studied and memorized by scholars in China and neighboring countries over two millennia. It is also a rich source of chengyu (four-character classical idioms) that are still a part of learned discourse and even everyday language in modern Chinese. Since the Qing dynasty, its rhyme patterns have also been analysed in the study of Old Chinese phonology. Early references refer to the anthology as the 300 Poems (shi). The Odes first became known as a jīng, or a "classic book", in the canonical sense, as part of the Han Dynasty official adoption of Confucianism as the guiding principles of Chinese society. The same word shi later became a generic term for poetry. In English, lacking an exact equivalent for the Chinese, the translation of the word shi in this regard is generally as "poem", "song", or "ode". Before its elevation as a canonical classic, the Classic of Poetry (Shi jing) was known as the Three Hundred Songs or the Songs. "Court Hymns", contains "Lesser Court Hymns" and "Major Court Hymns". Most of the poems were used by the aristocracies to pray for good harvests each year, worship gods, and venerate their ancestors. The author of "Major Court Hymns" are nobilities who were dissatisfied with the political reality. Therefore, they wrote poems not only related to the feast, worship, and epic but also to reflect the public feelings. The second and third stanzas still rhyme in Standard Mandarin Chinese and Cantonese, with the rhyme words even having the same tone, but the first stanza does not rhyme in Middle Chinese or any modern variety. 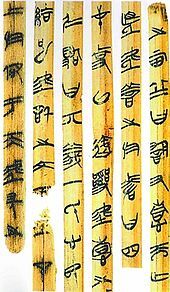 Such cases were attributed to lax rhyming practice until the late-Ming dynasty scholar Chen Di argued that the original rhymes had been obscured by sound change. Since Chen, scholars have analyzed the rhyming patterns of the Poetry as crucial evidence for the reconstruction of Old Chinese phonology. Various traditions concern the gathering of the compiled songs and the editorial selection from these make up the classic text of the Odes: "Royal Officials' Collecting Songs" (Chinese: 王官采詩) is recorded in the Book of Han,[c] and "Master Confucius Deletes Songs" (Chinese: 孔子刪詩) refers to Confucius and his mention in the Records of the Grand Historian, where it says from originally some 3,000 songs and poems in a previously extant "Odes" that Confucius personally selected the "300" which he felt best conformed to traditional ritual propriety, thus producing the Classic of Poetry. —— (1876). The She king, or The Book of Ancient Poetry (PDF). London: Trübner. Archived from the original (PDF) on 2014-04-12. (in French) (in Latin) Couvreur, Séraphin (1892). Cheu-king; Texte chinois avec une double traduction en français et en Latin [Shijing; Chinese Text With a Double Translation in French and Latin]. Hokkien: Mission Catholique. Karlgren, Bernhard (1944). "The Book of Odes: Kuo Feng and Siao Ya". Bulletin of the Museum of Far Eastern Antiquities. 16: 171–256. Karlgren, Bernhard (1945). "The Book of Odes: Ta Ya and Sung". Bulletin of the Museum of Far Eastern Antiquities. 17: 65–99. (in Japanese) Mekada, Makoto 目加田誠 (1991). Shikyō 詩経. Tokyo: Kōbansha. Xu, Yuanchong (2015). Xu Chong Classic English Translation of Ancient Poetry 1000: Songs (Hardcover) (Chinese Edition). Beijing: Dolphin Press. ISBN 9787511025647. ^ a b c d The *k-lˤeng (jing 經) appellation would not have been used until the Han dynasty, after the core Old Chinese period. ^ Riegel (2001), p. 107. ^ Nylan (2001), pp. 73–74. ^ Riegel (2001), pp. 107–108. Giles, Herbert (1901), A History of Chinese Literature, New York: Appleton-Century. Shi, Zhongwen; Hu, Xiaowen (2011), ""The History of Literature in The warring States Period"", The Whole History of China (10 volumes), China: China Books Publishing House, ISBN 9787506823623. The Book of Songs at Chinese Notes; Chinese and English parallel text with matching dictionary entries.